The "America" cans might not be making a return tour of your local liquor store, but Budweiser has a new patriotic brew ready for your Fourth of July picnic. 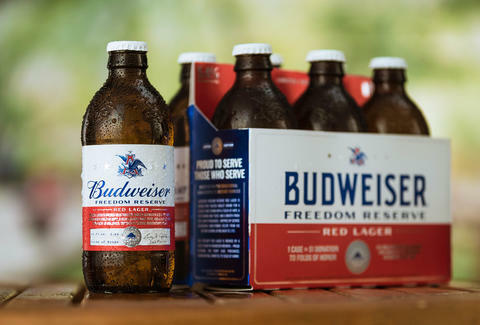 Budweiser Freedom Reserve, a red lager loosely based on George Washington's handwritten home-brew recipe, has just been released. Washington's scribblings provide more of a starting point than a full recipe because it would be impossible to perfectly replicate the beer. For starters, Budweiser's massive, modern operation has little in common with Washington's home-brew set-up. In Washington's recipe, after pitching the yeast, he instructed the brewer, "[I]f the weather is very cold, cover it over with a blanket." That's not quite how Freedom Reserve is brewed. "George Washington, along with the other founding fathers, were often known for being home brewers and creating their own recipes to share with their friends and family," Ricardo Marques, VP of Marketing, Budweiser tells Thrillist. "In his military journal dating back to 1757, George Washington incorporated molasses in one of his recipes to create a unique taste." The recipe is available to view via the New York Public Library, written under the heading "To Make Small Beer." Small beer is a weaker variety of beer -- often with an ABV around 1% -- made with the second running of the mash from a stronger beer. That's, of course, not what Budweiser is making here as it borrows flavors from Washington's recipe to create a red lager. "Take a large Sifter full of Bran Hops to your Taste," Washington wrote in his journal. "Boil these 3 hours. Then strain out 30 Gall. into a Cooler put in 3 Gallons Molasses while the Beer is scalding hot or rather drain the molasses into the Cooler. Strain the Beer on it while boiling hot let this stand til it is little more than Blood warm. Then put in a quart of Yeast if the weather is very cold cover it over with a Blanket. Let it work in the Cooler 24 hours then put it into the Cask. leave the Bung open til it is almost done working -- Bottle it that day Week it was Brewed." Strangely, he doesn't sign off with a "Dilly Dilly." Marques adds, "We took that recipe featuring molasses as inspiration to create Freedom Reserve Red Lager which offers a slightly sweet aroma with a smooth finish." The molasses and toasted barley grains in the new beer give at least a hint of what the first US president may have handed a friend more than 200 years ago. However, this is far from the first time a brewery has used Washington's scrawlings as inspiration. In 2016, Blue Point Brewery did it with their Colonial Ale and Yards Brewing has famously made replications of recipes by Washington, Benjamin Franklin, and Thomas Jefferson. 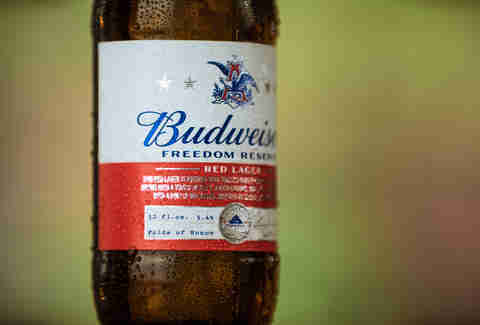 Freedom Reserve is the second beer Budweiser has released under its Reserve Collection label, following last year's Repeal Reserve. It will be followed by a collaboration between Jim Beam and Budweiser called Budweiser Reserve Copper Lager. Freedom Reserve is not only based on the first commander-in-chief's recipe but was brewed by veterans at Budweiser and will benefit Folds of Honor, a charity that provides educational scholarships to military families.